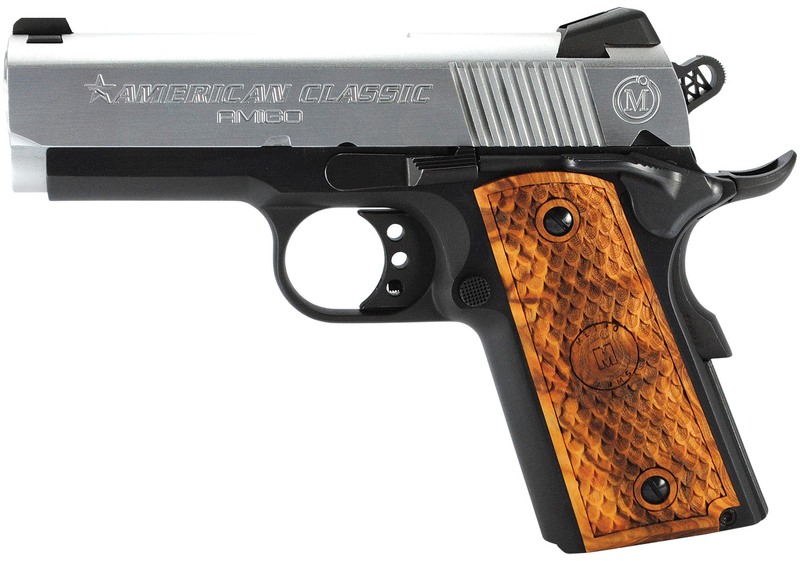 The Amigo comes in 45 ACP and is the smaller gun of the American Classic 1911 series with a shorter barrel length of 3.5" and a 7-round magazine. The frame is made of 4140 steel, and the slide is made of 4140 hammer-forged steel with rear serrations. It also has a throated forged-steel barrel. The Amigo features a flared ejection port, extended slide stop, extended thumb and beavertail grip safety along with a combat trigger and combat hammer. It has lovely checkered hardwood grips and a Novak-style rear sight with a dovetail front sight. Overall dimensions are 7.25" long, 5" tall, 1.25" wide and an empty weight of 32.45 oz. The Amigo is available with a deep blue, hard chrome or duotone finish.